Andre Courchesne - Consultant: IoT/IoE, hardware, electronics...And some Ruby to rule them all ! IoT/IoE, hardware, electronics...And some Ruby to rule them all ! 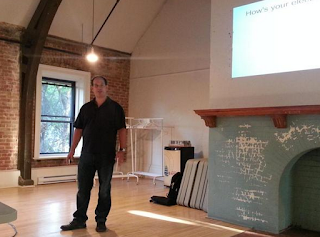 So last night (May 19th 2015) did a small talk at the Montreal.rb meetup (www.montreal.rb). While most talk at these meetup are Ruby/Rails related my talk was more on electronics, DIY/Maker stuff, IoT/IoE and yes how to use Ruby to work/control these embedded platforms. IoT-IoE, hardware, electronics...And some Ruby to rule them all ! Feel free to fork it and do whatever you want with it ! If you have any questions, comments, recommendations or find errors in any of the documents supplied, please feel free to drop me a line. Un vrai maître de conférences ! J'aurais aimé être là !